Apple’s iOS device comes with a built-in calendar app that provides lot essential features so beneficial for all. The Calendar app has options to add and set birthday, Events and All- day events reminder, besides, you can also sync other third-party apps with the available official Calendar app. there is an easy way to set up Calendar event and its alert, too. However, Sometimes numerous users encounter issue concern iPhone Calendar reminder not working. Since definitely, we know while alert has not arrived at the right time on iPhone screen, then the users will miss their event. So to fix an issue, we come here with potential answers, that would help you to resolve your painful iPhone Calendar notifications running iOS 12 or later problem. You Should try these best Calendar Apps for iPhone in 2019. You have to need the follow given steps carefully to fix iPhone Calendar Alert not working. Step 1. Go to Settings App on iPhone, iPad or iPod Touch. Step 3. Now scroll down the screen Tap on Calendar Alerts. Step 4. Make sure that Calendar Alert Tones switch isn’t None (Mute). If switch set None then please choose available other sound tones Or keep continues following Steps. 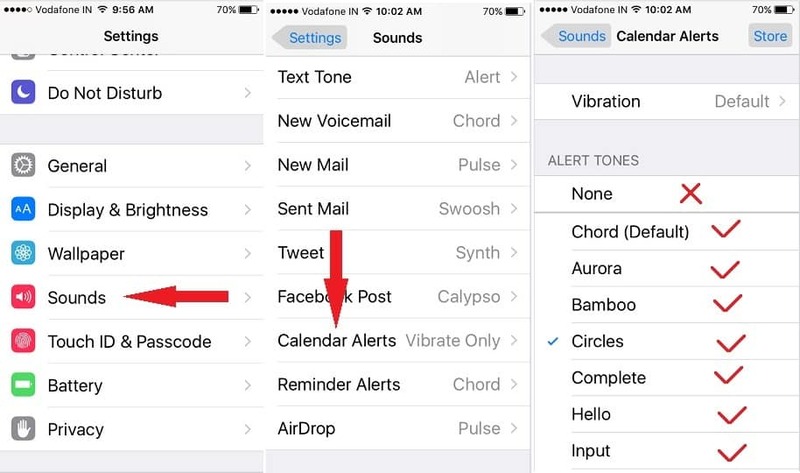 You can also choose Ringtones to your iPhone Calendar Alerts. Besides, on the bottom of the Calendar Alerts screen, you can see Classic tones, there are wonder tons such as real Alarm, Bark, Belltower, Blues, Crickets, Doorbell, Duck, Robot, Sci-Fi, Timba and more. Please change Notification Alert style and Sound too. Step 1. Go to the Settings app on your iDevice home screen. In More, you can also use Spotlight search to find Settings App quickly. Step 2. Tap on Notifications. Step 3. Hit on Calendar. Step 4. Turn toggle Allow Notification ON/Green. Step #5. Now you can see various sections on-screen including Upcoming Events, Invitations, invitee Responses, Shared Calendar Changes, and Event found in Mail. Now, choose one of this to make a change such as Allow Notifications, Calendar Alerts style (on Lock Screen, Alert Show or hide in Notifications Center, Banners Style) Sounds (tap on Sounds and update Settings like vibration, Alert Tones, choose Ringtones as Calendar Alert), Enable Badges to show number of Alerts on Calander App icon on Phone or iPad’s Home Screen. You can see the last Section called Options: “Show Previews” (Choose: (Always Default) if you keep when locked then you get alert only your Phone locked screen, and if you go with never then you never get calendar alert preview). That’s why I suggest choose Always default option. 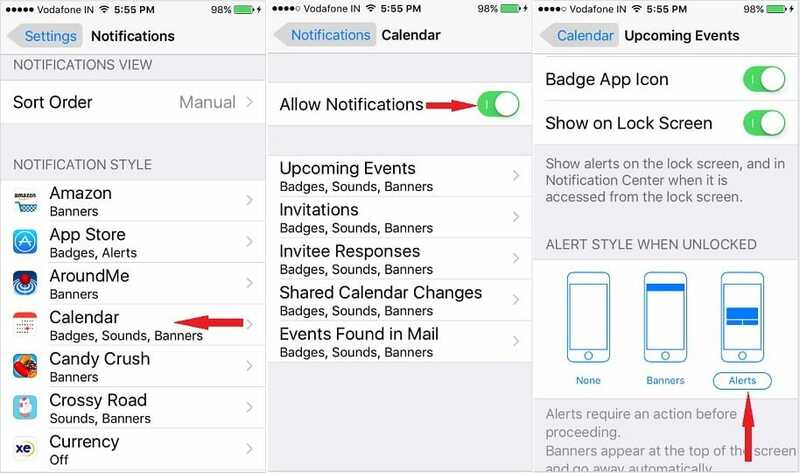 Here, you can see all toggles for Apple’s Official iOS calendar app notifications settings. Note: in case you are using Phone with headphone at that moment your iPhone calendar notifications alert doesn’t work while Bluetooth headphone connected to the iPhone. So remove headphone and test again. Still, the problem persists then go to the next solution. 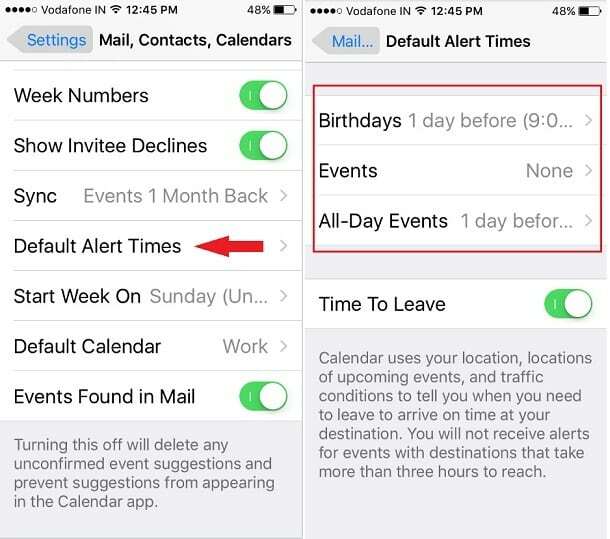 For iOS 10 and earlier iOS users Settings > Mail, Contacts Calendar > Default Alert Time > Birthday, Events, All-Day Events. Verify that the switch of Alerts isn’t None. Please, Setup current time zone where you are currently living. 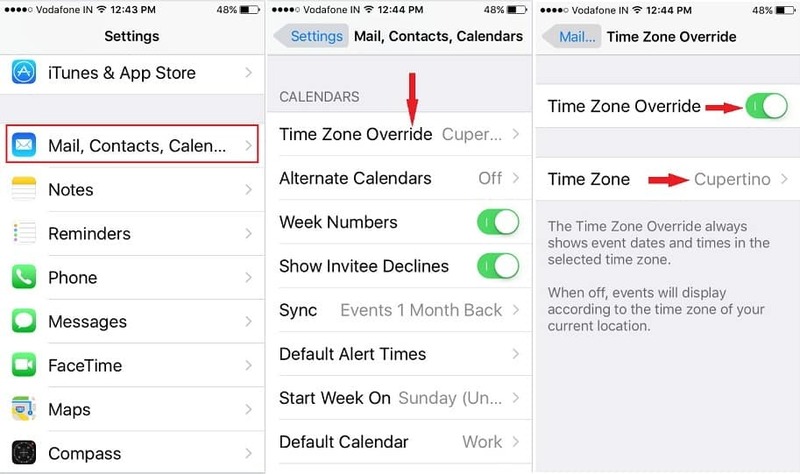 Settings > Mail, Contacts Calendar > scroll down the screen until you see the Calendar label and tap on Time Zone Override > Turn Time Zone Override. Different iPhone modal has a different way to force reboot device; All iPhone users should follow the bottom given steps to force rebooting device and get rid of Phone calendar alert issue. Press and quickly release Volume up button, then press and promptly release Volume down button and in last press and hold on Side button until you appear Apple logo on the screen. After successfully shutdown Phone, press and hold on Side button again to Turn On your Phone back. Lets Press and holding on Power button/ sleep-wake and Volume down button at the same time for 10 seconds and turn off your phone. To turn on Phone press & holding on Power button again. Just press and hold on Power button + Home button simultaneously up to 8 seconds and solve your problem. Don’t forget to press and hold power button again to turn your iPhone On. Even you setup reminder on iPhone Calendar but that doesn’t ring, I hope above all listed ways guide you to clear iPhone Calendar Reminder not Working. Last sort- You guy after attempting above all workarounds, none of the work in your case, then please take a fresh backup copy of your device and then restore like new Phone. we know the process little long but hope this trick will give you 100% positive result. Anything help need, please contact us! Please Share your feedback in the comment box.